Home/Blog/ Distribution/How to Advertise on YouTube: Free Guide! How to Advertise on YouTube: Free Guide! Do you tend to panic when you read the Word “Adwords”? Well, don’t! We are here to help you learn how to advertise on YouTube with Adwords for videos. With this easy free guide you will be able to start your first Campaign and show your commercial all around the biggest video platform on the internet. Because YouTube has over a billion users it’s essential for your brand and your marketing strategy. #1. Invest in a high quality video! 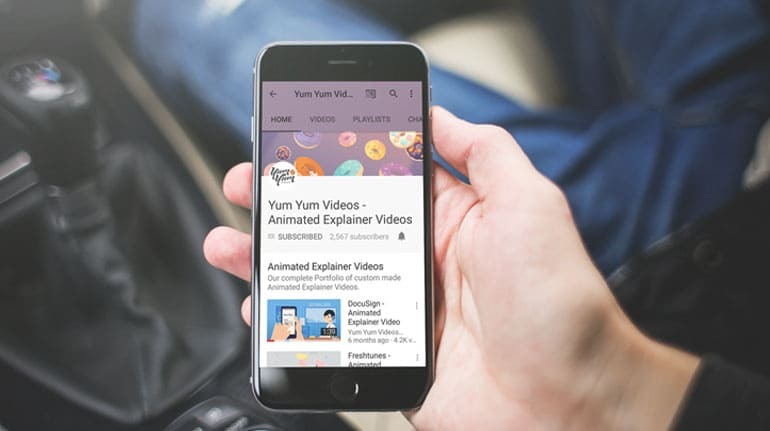 At Yum Yum Videos we’ve made commercials and also more than 300 animated explainer videos, which are other types of content you can also advertise. Now watch our own explainer video for more details! It is the typical promotion that appears before playing a YouTube video, with the option to skip it after watching the first 5 seconds. Google Adwords will only charge advertisers if the user watches at least 30 seconds, or the duration of the ad if it´s shorter. It will also charge them if the user interacts in any way with the video, like clicking a Calls-To-Action element. 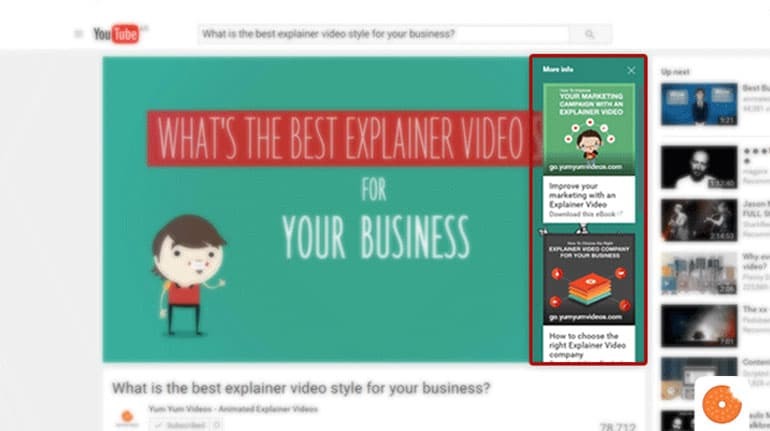 This type of ad allows you to place your video in discovery sections, like search results or as a related video. A small image of the video and a caption will show up there. It´s a great way to invite people to click to watch the video, so you should choose an attractive thumbnail with an interesting text to get more attention! There’s also another format called Bumper Ads. These are not from the TrueView family because the payment is based on impressions. They are shorter, up to six seconds long, and the viewers cannot skip it. You will be paying every time your ad gets 1000 views. The main difference is that they are massive ads that can reach more viewers and make your brand more visible. And remember that you can also try to promote your video on YouTube for free. This means your video can show up when someone searches for a specific keyword. This usually works better with educational videos. That’s what we did with our own “What is the best animated video style for your business” which is an educative video that reached more than 150.000 viewers. Every time you search for “Explainer video” in YouTube our animation appears first, and we didn’t spend a single dollar on ads! We have great guides to share with you on this matter and there are also more tips in our eBook “How to rank #1 on YouTube”, which you can download for free. Now that you are already registered with YouTube and you uploaded your ad to your channel we can start talking about Google Adwords. It´s an online service to advertise on Google and Youtube –which are from the same owners- and you can register for free. After doing that, go to your dashboard and link it to your YouTube account, you will find that option in the main menu. Once you login to Adwords, find the red button named “+ CAMPAIGN” on the dashboard. Just click on it and select “video” from the options below. Now you can choose a name for your Campaign and the ad format you’d like. In this step, make sure you have a defined marketing plan so you can decide which ad you prefer. At this point you can choose how much money you want to spend per day. We suggest to begin with a low sum and change it later if you want to boost it. A good idea is to estimate how much you can afford per month and divide it by 30 to get a daily budget. You can also choose the delivery method: standard, shows the ad evenly over time, or accelerated, which will show the ad as fast as possible. #6. Where will my ad appear? Adwords for videos lets you choose which network you want your commercial video to display in. It can be in the YouTube Search tool, meaning that when someone searches for a certain keyword your ad will show in their results, or YouTube videos, meaning your ad will appear before or around videos from the Google Display Network. YouTube is available in more than 88 countries and displays in 76 languages. So it´s crucial that at this stage you choose the locations where you want to show your ad and also the language of your potential viewers. Remember we said you must upload your video to YouTube? Well, here you can insert the URL address and choose your preferred ad sub-type: In-stream or video discovery ads, or you may choose both. Also, the standard settings will show your video on all devices but you can increase it or decrease it if you don’t want to appear on mobile devices at all. We suggest using a mobile-friendly ad so you can get the most out of it since around 70% of YouTube views occur on mobile. Take a look at the advanced settings. You can define the opening date for your campaign and the finishing date as well. Besides, you can choose specific day times to run your ad. Let´s say you are advertising a coffee brand, you may want to shut it down during the night and begin the runtime in the morning. This is just an example that shows how important a marketing strategy is! Cost-per-view (CPV) bidding is the standard form to define how much you will pay for TrueView ads. Here you can set the maximum amount you will pay each time someone watches 30 seconds (or the entire ad if it´s shorter) or interacts with it by clicking on the CTA that overlays or the YouTube cards. 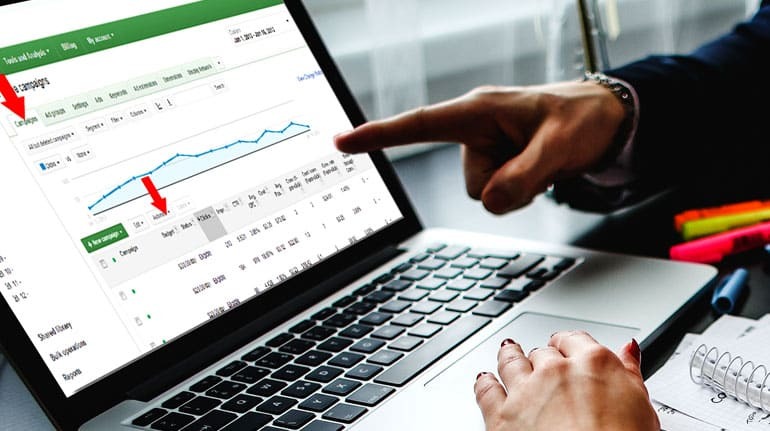 We recommend to start with a small amount and increase it later depending on the marketing impact, Adwords has several analytics tools to measure the performance. Learn more about bidding. This may be the most important part of your campaign. YouTube has over a billion viewers around the globe and it’s vital to narrow your target audience so you can reach potential consumers for your brand. As we explained in several posts, knowing your audience is a key in every marketing action. Then you can begin targeting individuals by demographic groups: gender, age, parental status, etc. You can also target people by defining certain topics from more than 2000 different options, by interests, like sport enthusiasts or beauty experts. Moreover, you can target by keywords and other methods like placement, in which you can aim to users from other sites or apps. You’re close to finishing your first campaign with YouTube Ads. Scroll down and click the “Save ad and ad group” button and you will have your ad running! Since you spent a lot of energy, money and creativity on advertising your video you might want to boost your promotion in other social media networks. This is called cross promotion and we can guide you with some ideas to expand your visibility. We’ve been through every step on how to advertise on YouTube, from creating an Adwords account and choosing the ad format, to targeting methods and more. So if you were hesitant about using Adwords for video, this free guide will clarify your doubts. Because it looks more complicated than what it actually is. So give it a try! Start sharing your brand’s video with YouTube ads and increase your visibility on one of the most popular networks on the internet. As we explained, TrueView is based on the idea of reaching interested viewers. So before thinking about how much money you will put into ads, start thinking about what you will offer to your audience to build that interest. Let us help you with that, at Yum Yum Videos we’ve made some very successful commercials and have lots of ideas for your brand! Contact us and we’ll get back to you in no time.